In Norse mythology, raven occupied an extremely important role because of its strong connection with Odin the Allfather. Like the wolf, raven suffered a great number of controversies as it was unpredictable and sometimes related to the devil and death. However, Norse raven was respected and the Viking Raven Symbol has become a meaningful symbol that many people fall in love with. Legend had it that, a pair of ravens were Odin's constant companions. In Norse myth, Odin had his ravens tell him everything in the cosmos. Every day, Odin let his ravens, whose names were Huginn and Muninn, fly out the whole cosmos and they would return to Asgard, perching on Odin's shoulders and telling what they had seen in the day. Thereby, ravens became a source of information and knowledge to Odin. As the nonstop seeker of wisdom and knowledge, Odin was often afraid that his ravens would not come back to him, which meant his loss of knowledge and wisdom. In many surviving depictions of Norse myth and Viking era, Odin usually appeared with a pair of ravens alongside himself. Accordingly, whenever ravens showed up, it meant Odin was right there. To the Vikings, when they were battling against their enemies, a raven's appearance would mean a lot to them. Because they believed if raven appeared, Odin was there to either support them or to welcome them to his palace of Valhalla. This helped the Viking warriors overcome the fear of death and fight until their last breath. The importance of raven to the Vikings was presented by how often the raven symbol was illustrated on helmet, armour, shield, ships, etc. Obviously, Norse ravens held a special part due to its embodiment of qualities. 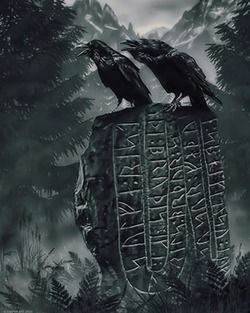 As mentioned above, ravens Huginn and Muninn were the constant companions of Odin. As long as the ravens appeared, it meant Odin's presence. When the Vikings fought on their combat, ravens would mean that Odin was welcoming them to his Valhalla which was the place for only the brave and honorable warriors. Huginn and Muninn were viewed as Odin's story tellers. They were the important fountain of knowledge to Odin. Therefore, when interpreting the symbol of ravens, people often view them as a part of Odin's mental power. They were the messenger of Odin and also somewhat affected Odin's way of thinking. According to the Viking tales, some Viking kings possessed a raven banner themselves. If their raven banner fluttered, they would rock the battle. But if the banner hung lifeless, their battle would be lost. Besides those mentioned meanings, ravens in Norse myth and Viking tales must possess the positive and supportive qualities of its species. Raven was the quiet observer who would supervise their surrounding. This is an important quality that we should learn. We should observe things around us, not only to defend ourselves but also to live our life to the fullest. Moreover, ravens signify rebirth and renewal in life.